Today there was an extremely moving service of remembrance at Sir Thomas Boteler Church of England High School, were they remembered many of the ‘Old Boys’ form the Boteler Grammar school as well as former students and teachers. 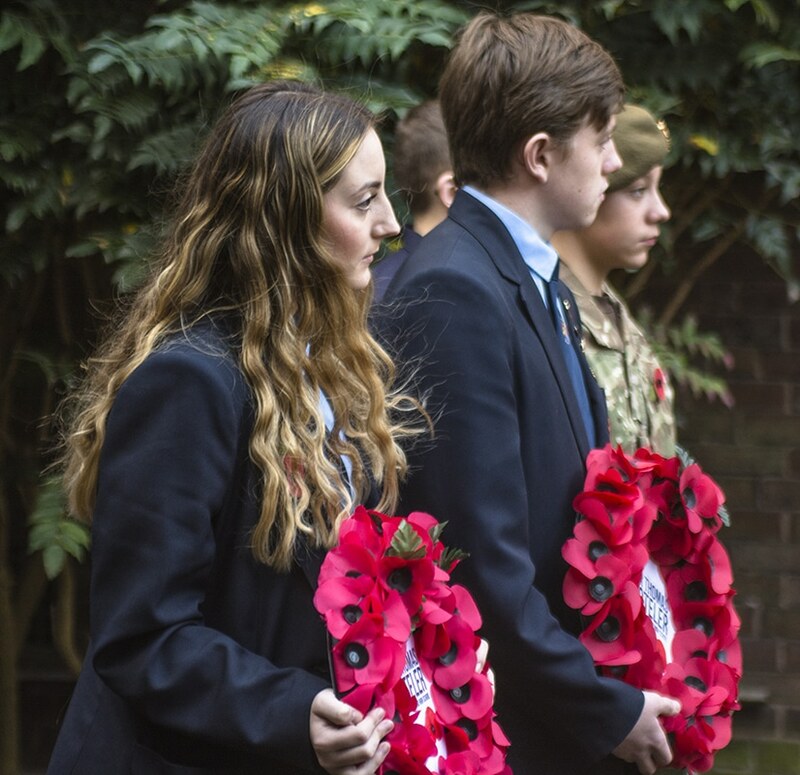 The Service began in the school’s Peace Garden, where members of the uniformed service attended a short tribute in front of our school cross which was decorated with clay poppies, which had been made by the students. This then went into a full Service attended by the whole of Year 7 and Year 9. The students this year have played a major role in the Remembrance preparation. 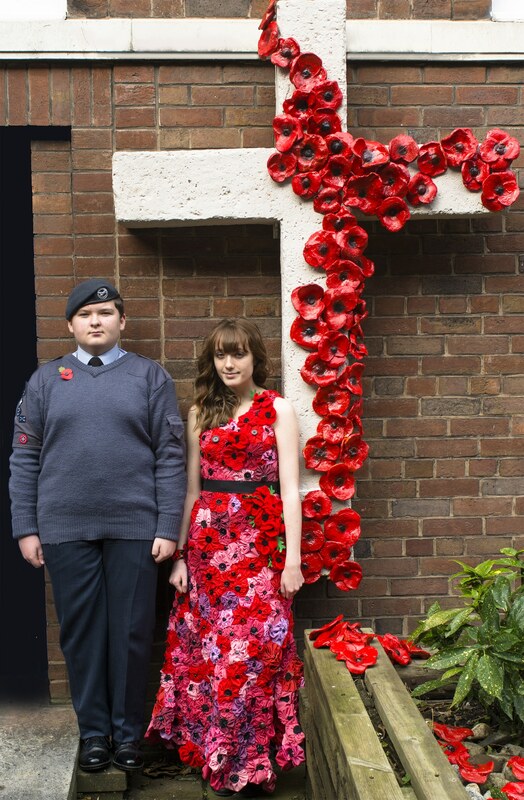 The poppy dress, worn by Sophie Barber, is made from over 500 individual fabric poppies. During the last month, each student in every art class across the school has made the poppies, and staff and their families have also donated poppies they have made. Head of Art Mrs Joice then put them together to create this dress, in memory of those fallen. The dress was initially inspired by a display Mrs Joice saw in a Salvation Army charity shop in Lowestoft last year. Before each poppy was made, the students were shown the Royal British Legion website and were read ‘In Flander’s Field’, to remind them of the significance of the poppy. The school’s visitors commented on how impressed they were with the dress. Mrs Scott-Herron says “This was a very powerful statement and was a very moving tribute to remember all those on our roll of honour”. Inspired by Paul Cummin’s poppy display of 2016 in London, each Year 7 student made from clay an individual poppy which they then decorated with papier mache and acrylic paint. These clay poppies then adorned the school cross, made by Shropshire based artist Jas Davidson, which is mounted in our Peace Garden. The poppies were placed in such a way to create a waterfall effect down the cross, flowing into the flower bed below, creating a poppy garden. Mrs Joice’s intention is for all future Year 7’s to create a clay poppy in the same style which will be added to our poppy garden. The English department encouraged students to write poems about war and remembrance. These poems are now displayed on the windows of the corridors looking out to the School’s Peace Garden. Mrs Joice says ‘the students worked so hard and I was very impressed with the enthusiasm and respect they showed in the creations they were making. I was overwhelmed to see Sophie modelling the dress, she wore it with modesty and pride. Seeing all of the poppies together that the students had made showed a powerful mark of respect and remembrance”. Here is our Order of Service for our Remembrance Service on Friday 10th November 2017.